McCormick sophomore Wendy Roldan is confirmed at Senate on Wednesday as Associated Student Government’s new vice president for student life. Senate also discussed a tobacco-free resolution and approved ASG’s operating budget. Associated Student Government Senate discussed Wednesday a resolution that would make campus tobacco-free, confirmed a new vice president for student life and approved next year’s operating budget. 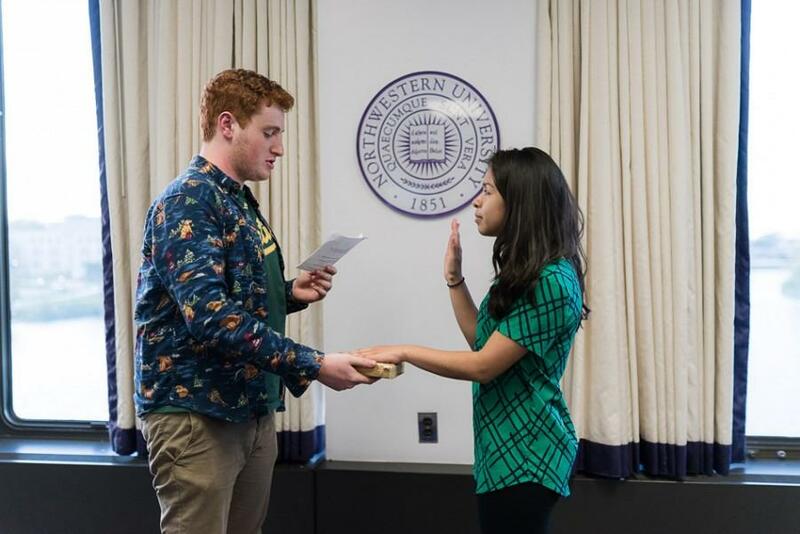 Weinberg sophomore Alec Blumenthal co-authored a resolution calling on Northwestern to go tobacco-free by Fall Quarter 2016. The resolution asks the University to create a task force to oversee the policy change. Blumenthal, an off-campus senator, introduced the resolution and took questions. He pointed to other Big Ten schools, including Ohio State University and Indiana University, that are tobacco-free. However, Senate rejected a similar proposal in October 2013. A request for a tobacco-free campus goes further than one for a smoke-free campus, because the former includes a ban on electronic cigarettes and chewing tobacco. Senators will vote on the resolution May 20. Title IX Coordinator Joan Slavin and Tara Sullivan, assistant dean of students and director of student conduct and conflict resolution, presented and took questions about the University’s revised sexual misconduct policy. The new policy consolidates the “Policy on Sexual Misconduct, Stalking, and Dating and Domestic Violence” with the University’s Violence Against Women Act policy and procedure document. Slavin and Sullivan passed out drafts of the policy and Slavin reviewed some of the updates to the policy. Weinberg junior Erik Baker, the senator who represents four sexual health and sexual assault-related groups, said two of the biggest changes he noticed were the revamping of the definitions of stalking, dating and domestic violence and what it means for a student to be incapacitated. Additionally, Senate moved to confirm McCormick sophomore Wendy Roldan as vice president for student life. She said her two years on the student life committee helped prepare her for the position. SESP junior Chris Harlow, Roldan’s predecessor, told The Daily he’s worked on projects with her before and was impressed by her passion for helping other students. Roldan’s confirmation ends a three-week vacancy in the new post. Senate rejected Weinberg sophomore Isaac Rappoport, the selection committee’s original nominee for the slot, following a lengthy discussion at its April 22 meeting. Senate also voted to approve an operating budget for next school year. ASG is funded by the student activities fee, which students pay each quarter to make up the nearly $1.5 million ASG allocates to student groups and itself. Students will pay $58 for the fee per quarter next year. Almost half of the $80,000 budget will go back to students through stipends, grants and awards. These include the Student Engagement Stipend, which allows selected students $500 each to increase time in extracurriculars, and the Student Events Stipend, which will give selected students about $30 each per quarter to cover costs for on-campus events. A new item in the budget is $4,000 for a campus-wide mental health campaign. The project, inspired in part by ASG’s Take Time campaign, will work to encourage students to find time for relaxing and taking a break from school work. Harlow worked with Roldan in leading much of ASG’s mental health efforts over the past year. Harlow told The Daily that students often view downtime as time that could be spent on school work, a mindset that can hurt their mental health. According to the budget, the authors hope the University will pay for the campaign and make the $4,000 allocation unnecessary, but decided to include it in the budget just in case. More than a quarter of the budget will go into the expanded Wild Ideas Fund. The Wild Ideas Committee will allocate $22,550 to students and student groups, pending Senate approval if the request exceeds $500. And in the second themed Senate of Star’s tenure, some senators observed “purple pride” day. Star told The Daily themed senates are designed to remind senators who they represent.